Tokyo, June 30, 2016 --- Hitachi, Ltd. (TSE:6501, “Hitachi”) announced that along with Mitsubishi Electric Corp. and Intel K.K. (Japan), it proposed, and received approval for Factory Automation Platform as a Service (FA PaaS) Testbed1 in the field of next-generation factories at the Industrial Internet Consortium(IIC2 ). The goal of this testbed is to test open IoT platforms that seamlessly integrate Factory Automation (FA) in the front lines of manufacturing and Information Technologies (IT) that support management and operation, in collaboration with Mitsubishi Electric and Intel. Hitachi will incorporate the results of these tests into the IoT platform “Lumada”, and create new solutions along with customers and partners. In recent years, amid increasingly intense global competition in the manufacturing industry, there has been a growing demand for more rapid product development and market introduction, quality improvements and shorter lead times in order to quickly respond to the rapidly changing market environments and management environments through the introduction of new technologies and collaborations between companies. In this backdrop, there has been a growing expectation for overall optimization that uses data related to manufacturing in the increasingly global supply chain to connect the front lines of manufacturing with management, suppliers, and customers. This in turn has given rise to a need for secure connections between a variety of devices in FA environment and cutting-edge IT services (e.g., Big Data and the cloud) and for the accelerated development of applications in the field of next-generation factories. These platforms include IoT data processing platforms that processes Big Data, IoT head end systems, and IoT gateways that securely connect the service platform layer with FA environment, and FA edge devices that provide functions unique to FA applications, and which also enable communications with FA devices in the field of next-generation factories. In addition, the advantage of IoT platform tested in this testbed is that it can accelerate application development for next-generation factory by making available of integrated environment between FA environment and service platform layer. Hitachi is in charge of IT related products (IoT data processing platforms, IoT head end systems etc), software which connects each devices in this testbed, and system integration of the testbed. Mitsubishi Electric is in charge of FA environment (FA edge devices, applications, PLC*3 , and drive units), and Intel is in charge of IoT gateways, and supportive coordination with IIC. Hereafter, under collaboration with Mitsubishi Electric and Intel, Hitachi will complete tests of secure connections between FA environment and service platform layer, as well as tests of the effectiveness of testbed functions and the flow of operational data from the perspective of the front lines of manufacturing, by June 2017. After that, it will conduct “use case” tests with IIC member companies and customers. Hitachi offers an extensive lineup of solutions that comprise products, services, consulting, and backbone operation systems such as SCM4 and ERP5 , as well as frontline systems such as MES6 and SCADA7 . These solutions are based on expertise in core operations cultivated through Collaborative Creation with customers in the manufacturing industry, along with security technologies, the Big Data analysis tool “Pentaho”, and “Hitachi AI Technology/H” solutions, which utilize cutting-edge artificial intelligence (AI). 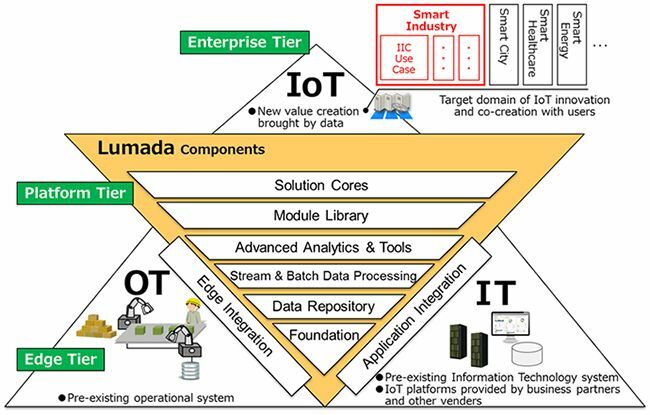 In May 2016, Hitachi began to provide the IoT platform “Lumada,” which combines IT with highly reliable Operational Technologies (OT) that have been cultivated over many years. Lumada comprises open and highly versatile systems, so it can be linked easily with other platforms and systems not only in the manufacturing industry, but in a broad range of other applications and industries as well. Hitachi will incorporate the results of these tests into Lumada, and contribute to the business innovations in the manufacturing industry with partners like FA devices vendors and application providers by connecting data of the front lines of manufacturing with management, suppliers, and customers. Hitachi will also work with a variety of partners in Japan and around the world to submit joint proposals to proliferation agencies in addition to the IIC. *1Testbed: Testing platform based on reference model of IIC which enables to test solutions in the situations similar to the real world. *2Industrial Internet Consortium (IIC): Global nonprofit organization for realizing growth acceleration which is consisted of over 240 organization with public-private partnership. *4Supply Chain Management (SCM): Management methods for optimizing the supply chain as a whole, including raw materials, components, and completed products.